At first I thought that this easter egg was just limited to the MDN website. But after looking at the tabzilla.js code, I found that it works across a number of Mozilla websites, which make use of Tabzilla. 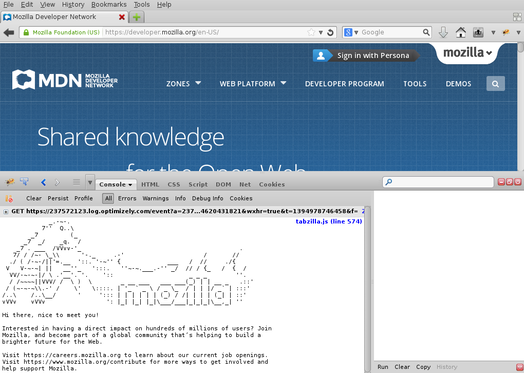 Tabzilla is the universal tab displayed on Mozilla websites. If you focus on the image above — at the top right corner of the web page, the lowercase "mozilla" with the dropdown arrow is Tabzilla. As I mentioned above, this is not limited to the MDN website. It is present on all those Mozilla websites which make use of Tabzilla, and which satisfy the conditions present in tabzilla.js. // Careers teaser in error console. // Try to only show on stage and production environments. The if statement got me curious, as I had never heard of webmaker or allizom. A quick search later, I found that Webmaker is an educational initiative by Mozilla, with a focus on the Web and related technologies.